On Lynda’s last flight in the Pitts, Don demonstrated advanced maneuvers. 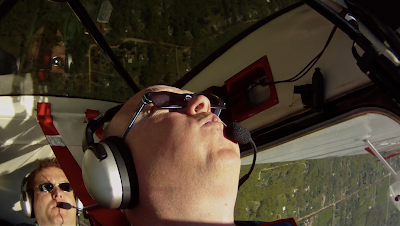 Here’s a frame grab from an outside half loop (from inverted, push to upright). If Lynda’s hair was up on the canopy in here -1G inverted flight, it was plastered there in this maneuver. Don also did an outside recovery from a hammerhead with Michelle, which I think was the maneuver during which Michelle experienced the max negative G of Acro Camp. I think I took a picture of the G meter just for posterity. The cataloging of Day 4 (17 May) is almost complete. Then I start watching the ground footage, which will be a little more straightforward than the aerial footage has been so far. Here’s footage from the Hero cam on the Pitts moments after startup. First Barry, then Steve, then Rod decide to surf the prop blast of the Pitts. This is from Saturday 15 May, Day 2 of flying. I’ve been working my way through the footage from Friday 14 May, the first real day of flying for Acro Camp. I’ve been working mostly with the wing-mounted and other exterior camera footage over the last week. But, this evening, I began going through some of the footage from the in-cockpit cameras as well. 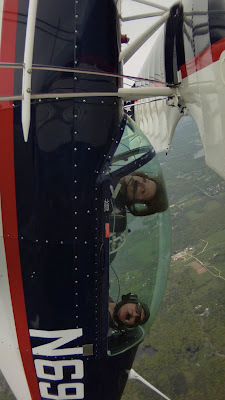 I’ve decided that no human has ever had more fun flying aerobatics (or doing anything else) than Paul Berliner. 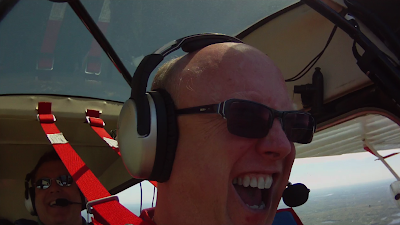 I could tell that he was smiling from the wing cam footage, but the in-cockpit cameras really tell the story. There are even times that I can hear min shouting over the engine noise on the ContourHD camera (and I don’t have the intercom audio synched up yet, so it’s strictly ambient sound for now). 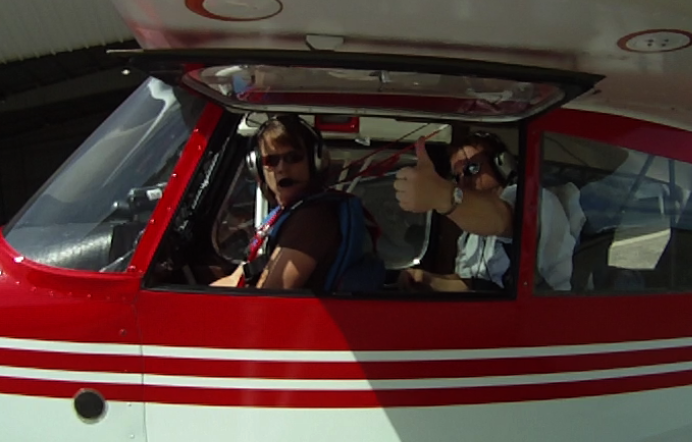 The frame grab above is Paul’s reaction to his very first loop. I think they heard about it in the tower back at Pontiac. Without the need for the radio. It turns out that Paul has a G-face as well. In fact, I think it’s the same as his zero-G face. Here’s he’s pulling up for his second loop. Paul pulls a little less hard on the loops than Jim, but not much less. He got nice round shapes out of the loops that he did. I can’t tell whether Barry’s helping, but I suspect that it’s mostly Paul. Michelle also got up at the end of the day for some pattern work in the Citabria. 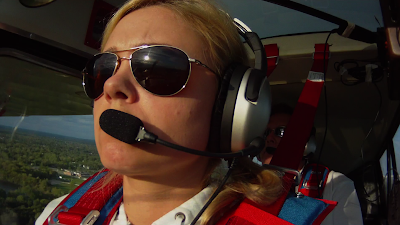 I discovered some issues with the ContourHD shutter artifacting when the prop shadow falls across the pilot’s face. It’s a little like skinny horizontal Venetian blinds. But it’s almost worth it when you get sun angles like this one. I’m still having a good time with the extent to which the IPs seem to pay attention to the camera. Here, Barry gives a thumbs-up just before taxiing. I understand that there were some pretty good conversations in the cockpit, as well, and I’m just beginning to get around to going through the intercom audio. I think I’ll do that once I get it synched up with the video. I’ll put together a multiclip for each flight and then watch each flight all the way though one camera angle at a time. It’ll be time-consuming, but it’s really the only way to get the whole story and identify all of the most interesting/compelling/beautiful moments.